A 2.5D fighting game developed by the independent developer Digital Crafter. Fight of Gods resembles other fighting games such as Capcom's Street Fighter IV, so the character models are 3D, and the battles are set in two-dimensional environments. 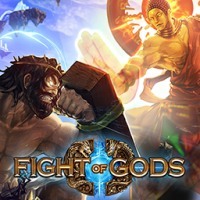 Fight of Gods for PC is a 2.5D fighter game developed by a small studio called Digital Crafter. The studio specializes in creating games for mobile devices (iOS and Android); however, the game described herein has been designed for PC. The main aspect, which makes the game described herein different from other games, is its main theme. In the game, a player gets to control not regular heroes but the gods. This includes e.g. Jesus Christ (Christianity), Buddha (Buddhism), Zeus (Greek mythology), and Odin (Norse mythology). The developers have also implemented into their game locations typical for each religion, e.g. Mount Olympus and the Garden of Eden. In terms of its gameplay, Fight of Gods for PC highly resembles games such as Street Fighter IV. As befits a 2.5 fighter game, Fight of Gods delivers 3D character models set in 2D environments. The gods can move left, right, jump, and squat. The attacks are mounted with four buttons, responsible for kicking and hitting. Of course, these attacks can be joined in spectacular and dangerous combos – each character features his own skills, a range of moves, and blows. The system is very elaborate, thus before fighting another player, one should practice his skills in the tutorial mode. Apart from the Training Mode, Fight of Gods for PC allows one to fight AI-controlled opponents in the single player mode. Moreover, one can fight gods controlled by other players in the multiplayer mode. Interestingly enough, after the game has become available on Steam in early access, the Valve's platform has been blocked in Malaysia. The government has stated that the game poses a threat to the sacrilege of all religions and the interracial harmony. Eventually, Fight of Gods has been withdrawn from circulation in that country.